It always starts out so innocently. For several years, in early May, a local garden club has held a plant sale at the home of one of their members, just off a busy road that I drive up and down many times during the week, especially on the weekends. Every year, I see their sign advertising the plant sale but always on the day of the sale, I seem too busy and rushed and hurried to stop and look. But this year, I made myself slow down, for just a few minutes, and stopped in to see what they had for sale. 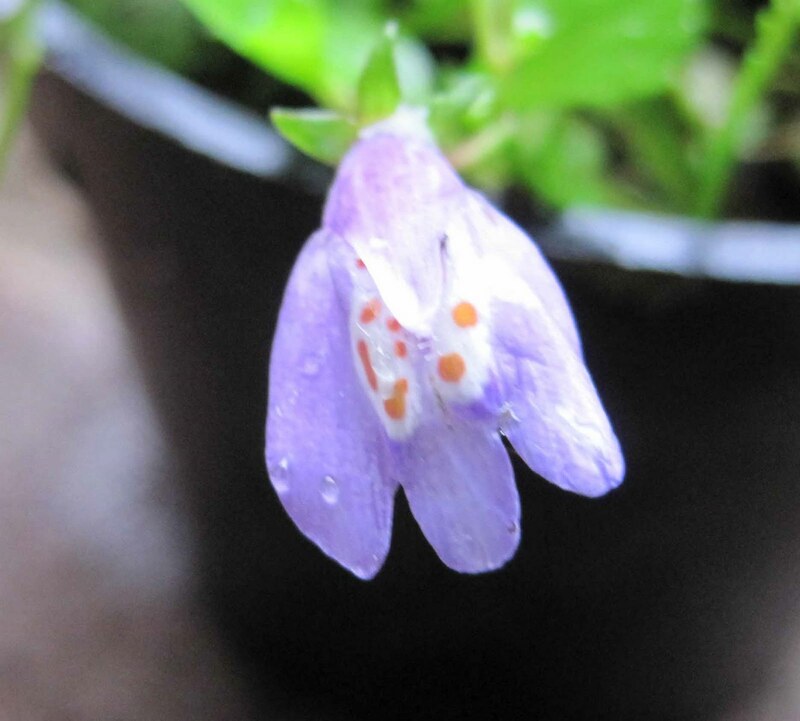 I browsed the tables of daylilies and irises, checked out the daisies and hostas, and then my eyes landed on a tiny groundcover of a plant with pretty snapdragon-ish flowers labeled Mazus. It seemed vaguely familiar, so I purchased it and took it home. In the rainy days since then, it has been in its pot, on my front porch, waiting with all the other plants for an evening without rain, an evening when the grass doesn’t need to be cut, for me to plant it. It is a groundcover, clearly, and so it must be approached with caution, for its very nature is to cover the ground, and anything else that might grow in its path. Ground-cover. 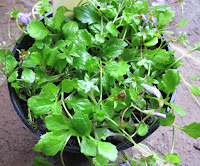 It was quite easy to do an online search for Mazus and find out that my new little plant’s full name is Mazus reptans. Though one site did indicate it was in the Snapdragon family, Scrophulariaceae, it appears that once again, through the use of phylogenetics, botanist have moved Mazus out of the Scrophulariaceae family and into the Phrymaceae family. At one time, Phrymaceae only contained one genus, Phryma, which has just one species, leptostachya, that goes by the common name of Lopseed, giving the whole family the nickname of the Lopseed family. However, many sources still show Lopseed as being in the Verbenaceae family. I guess they haven’t caught up with botantists who use phylogenetics to move plants all around to different families and make up new plant families as they go. Holy Linnaeus! I sure don’t remember plant taxonomy being quite this taxing when I studied it in college. But I do remember it being this fun, sort of. 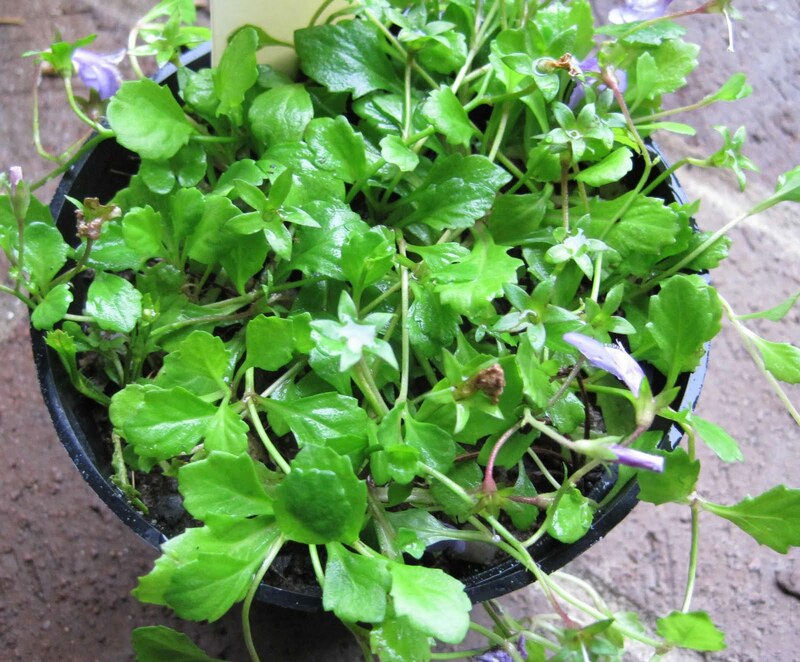 As soon as it stops raining and the ground isn’t quite so saturated, I’m going to plant my one and only plant from the Phrymaceae family, my new Mazus reptans, someplace in the back to see how it does. I just hope it doesn’t turn on me and become a menace to the garden! I hope it only covers the ground you WANT it to cover. (Who are we kidding?!) That bloom with the fairy footprint is precious. In a book I'm reading, Penstemons, by Bob Holt, he remarks about this taxonomic jumbling done by botantists—esp. in Scrophulariaceae (being Penstemons family, too). He said it didn't bother him as it only meant that science was just trying to understand the plants better and give us more information for our success in growing them. It is hard to change up names, though. Especially after years of knowing a plant only to have it's name changed on you! This is spooky timing; I only saw my first Mazus about seven hours ago. It's a very pretty plant I have never heard of. I will be waiting to see how it does for you. I like the footprints. It looks like the fairies had run through the mud before dancing on this blossom. I have never heard of this plant. Good luck. why, why do they make it so difficult to remember a plant's name! they must do it out of badness or to keep themselves in a job :) A very pretty plant and sure if it's attracting fairies (an endangered species as people aren't 'believing' anymore) all the better to get it in the ground and romping away! I hope you can keep that cutie tamed. It will be nice. And no, I did not know they were fairy footprints. That is good to know! H.
If it becomes too prolific for you, I'd love some to put out by the gazebo..... but make sure they are fairy-free because if not, the dogs might decide to have a fairy snack! It will be interesting to see what Mazus does in Indiana, Carol - I planted it years ago and saw moderate growth in cooler rainy years, but it just about disappeared when we had hot & dry summers. Hope it behaves nicely for you! This is why I have trouble learning botanical names--as soon as I learn one, they change it! Hope this little Mazus comes from a well-behaved family. Holy Linnaeus! You crack me up. Maybe it's kind of like these plants are searching for their birth parents. We still love our adoptive parents, but it's nice to know where you really come from and to learn a little about your roots. Here's hoping the little fairy footprints stay approximately where they're planted. So cute. I am fairly new to your blog. I wanted to comment about the Mazus Reptans. I have had it in my perennial border (northern utah zone 6) going on 3 years now and I love it. It has stayee within a 12-18' radius of where I originally planted it. It is so beautiful covered in it's fairy footprints in the spring. I haven't found it to be invasive at all. Just a very delightful little ground cover. I hope you have as good a luck with it as I have.